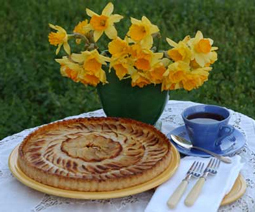 Fresh Apple Tart with Grapeseed Oil Crust - A recipe from Savor California, the online showcase for extraordinary gourmet foods and beverages from California. Sift flour and salt into bowl. Add Salute Santé! Grapeseed Oil and butter. Beat in mixer until particles are the size of small peas, about 30 seconds. Slowly add water, a tablespoon at a time, until particles are moistened. Use only enough water to make pastry form a ball. Chill in refrigerator for 15 minutes. Roll to 1/8-inch thickness between waxed paper. Place pastry into pie plate or tart dish. Press firmly against bottom and sides. Trim and crimp edges. Yield: Two 8 or 9-inch single crusts or one 8 or 9-inch double crust. Cut apples in thin slices lengthwise. Arrange fruit slices by fanning out around tart dish, overlapping as you go. Complete the circle. Squeeze fresh lemon juice over the whole tart. Sprinkle with sugar. Bake at 400º F for 35 to 40 minutes. Substitutions: Use any fresh fruit in season: plums, peaches, nectarines, or cherries.